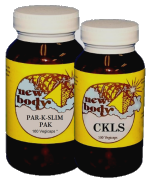 The New Body Herbal Formula CKLS was created to stop and eliminate toxins in the colon, kidneys, liver, spleen and other organs build up occurs. CKLS has been used to eliminate stress, sluggishness, headaches, mucous build-up, tiredness, worms, colon pockets, harmful bacteria, and constipation. 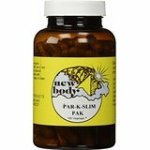 PAR-K-SLIM was designed to trim away unwanted pounds while restoring nutrition to your body. Par-K-Slim promotes weightloss, raises metabolism, lowers the desire to eat and cleanses the disgestive system. When combined with healthy food choices, Par-K-Slim will help maximize weightloss. The herbs in PAR-K-SLIM were put together in perfect balance to cause the body to be in perfect harmony. This powerful combination allows clean up of the vital organs first, followed by elimination of excess weight and restoration of nutritional harmony.